This is a catch-all area for house concert-related threads that don't fit neatly into other, more specific sub-forums. If you have something you want to post about house concerts that doesn't fit neatly within any of the other sub-forums, post it here! What works for you when you're setting up shows with your hosts? What's not working yet? How can you maximize your success? The more detailed and specific the better! How do you find house concert hosts? What types of people have been particularly good hosts? Anything to watch out for? What makes for a good concert situation? What you've learned (or want to learn) about sculpting an effective house concert performance. Song choice, song order, set decoration, between-song banter, and more. "I just did my first house concert, and ..."
What went right? What went wrong? What do you need help with? Discussion around fostering and maintaining connections with the people who support what you do. 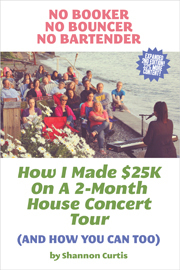 Shannon's "House Concert Host Guide," sample invitations for hosts, and more! Got a tech question? Post it here and the community can help. Off-the-beaten-path food spots you want to recommend, hotel suggestions, car maintenance routines, good swimming holes, et cetera. What have you learned on the road that you'd like to share? Got something you want to share with the group? This is the place to do it! New music you've recorded, a new video, your upcoming tour schedule ... anything you think is relevant. Links only, please ... media attachments are disabled in this forum so our server doesn't overload.